Department of Pharmacy, Annamalai University, Annamalai Nagar-608002, Tamil Nadu, INDIA. To compare the molecular activity of curcumin and resveratrol on selected breast cancer protein receptors and to investigate their combination for synergism against human breast cancer MCF-7 cell line. Curcumin and resveratrol were subjected to insilico docking studies using glide to investigate the drug activity against HER2, human oestrogen receptor, ERBB2, epidermal growth factor tyrosine protein kinase C-SRC, and HSP90 proteins. MTT assay was used to assess cell viability of curcumin and resveratrol individually and in combination at 1:1,1:3 and 3:1 ratio respectively. The insilico study revealed good glide score and glide energy for these drugs against breast cancer protein. Curcumin and resveratrol has more binding affinity for proteins with varying amino acid interaction sites. IC50 for curcumin and resveratrol was observed to be 21.29 and 38.30 µg/ml respectively. IC50 for the combined treatment with curcumin and resveratrol at the ratio of 1:1,1:3 and 3:1 were observed to be 28.06, 15.20 and 8.29 µg/ml respectively. 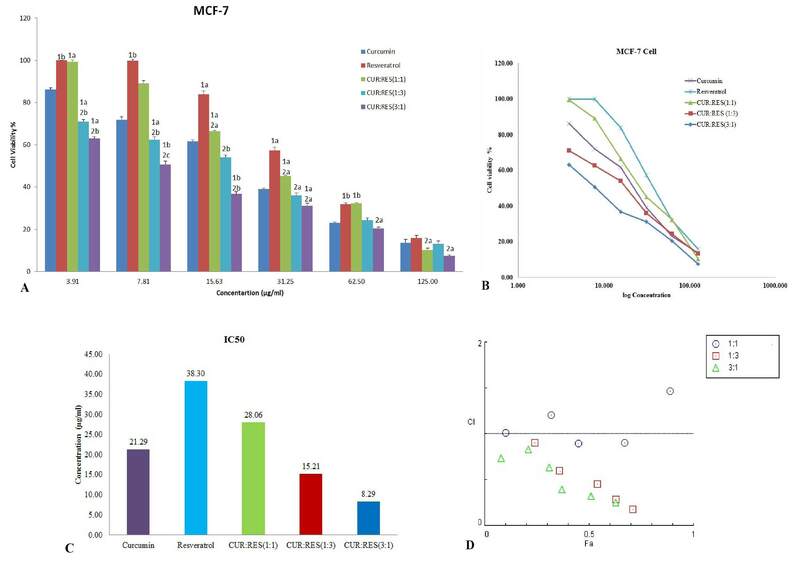 Combined treatment of curcumin and resveratrol at equal ratio exhibited additive effects while at the ratio of 1:3 and 3:1 exhibited a strong synergistic effect on the cytotoxicity of MCF-7 cell line. 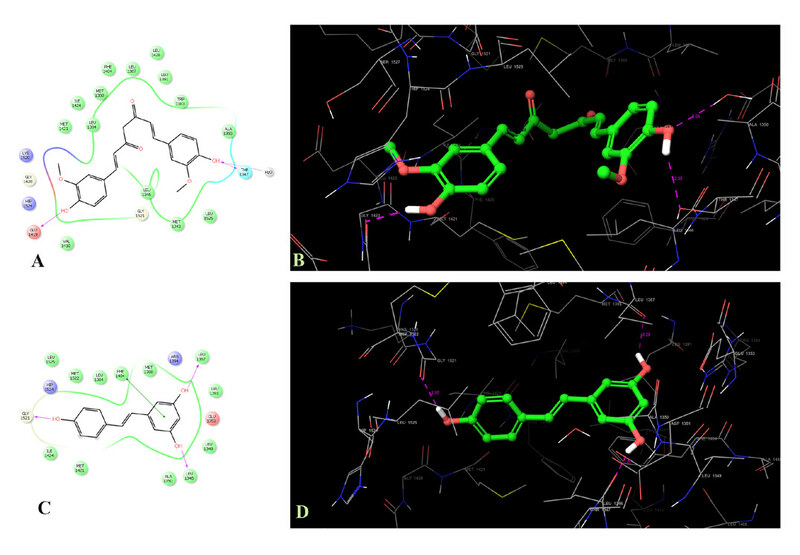 Insilico docking analysis helped in identifying and organizing the structural similarity/diversity at the molecular level activity of curcumin and resveratrol. In vitro cell line study provides an insight into the potential application of curcumin and resveratrol codelivery for the chemoprevention and treatment of breast cancer. Recent research focus on multidrug combinations in cancer chemotherapy in which one drug enhances the activity of the other, by varying mechanism. Natural drugs curcumin and resveratrol exhibit close similarities in molecular structures and shares the absorption and efflux between them replacing one for the other when used in combination.3 These drugs exhibit a synergistic anticancer effect in colon cancer, lung cancer and hepatocellular carcinoma4-6 They found to exert synergism against inflammation.7 The Synergistic potential of curcumin and resveratrol in declining the active tumour suppressor protein in the lungs of Benzo[a]pyrene treated mice were reported earlier.8 In vitro cell line study and in vivo study in mice for prostatic adenocarcinoma using curcumin and resveratrol drug combination induced apoptosis and decreased cell growth.9 Enhancement of curcumin activity in the presence of resveratrol is reported against head and neck carcinoma.10 The synergism mechanism was earlier reported for antioxidant activity where if curcumin is oxidised, resveratrol regenerates curcumin by reducing it and enhance the antioxidant activity of curcumin.11 Only few studies are reported for combined use of curcumin and resveratrol for breast cancer. Combination of these drugs resulted in apoptosis in cigarate smoke condensate transformed breast cancer epithelial cells.12 This article aims to compare the molecular activity of curcumin and resveratrol on certain breast cancer receptors, as an in vitro study to explore the combined use of curcumin, resveratrol in breast cancer treatment. Based on the mechanisms of curcumin and resveratrol against cancer cells, breast cancer protein HER2, human oestrogen receptor, epidermal growth factor tyrosine kinase receptor ERBB2, tyrosine protein kinase C-SRC and HSP90 were selected to study the molecular activity and compare the binding interaction of curcumin and resveratrol. 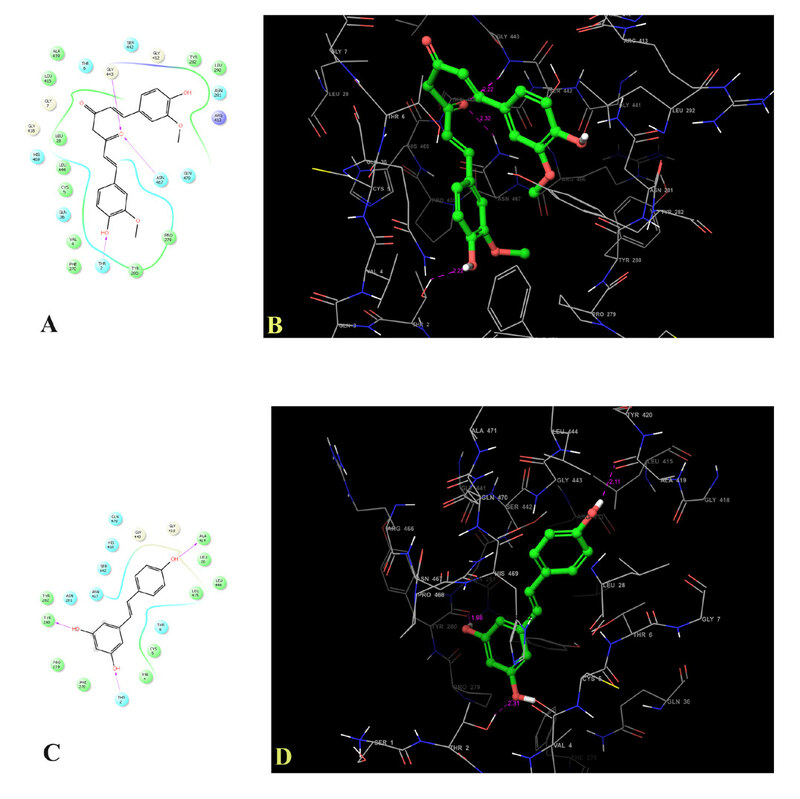 Among the various computational methods employed to assess the anticancer potential of drugs, docking is the most widely used tool.20 Hence insilico molecular docking analysis were performed on the selected cancer receptors for curcumin and resveratrol. With the interaction study results against these proteins, inhibition of cell growth by curcumin, resveratrol individually and in combination against MCF-7 cells were examined to study the synergistic effect on cytotoxicity. The protein data bank (PDB) web contains a collection of 3D structure of large biological molecules including proteins and nucleic acids. The structure of HER2, Human Oestrogen receptor, ERBB2 receptor tyrosine kinase, Tyrosine protein kinase C-SRC and HSP90 proteins having PDB ID 4RJ3, 2IOK, 2A91, 2SRC and 2VCJ with resolution of 1.63 A°, 2.4 A°, 2.5A°, 1.5A° and 2.5A° respectively was retrieved from the protein data bank http://www.rcsb.org/pdb/. All the interacting heavy atoms, water molecules, metal ions are removed and added with hydrogen atoms, stabilized with minimized energy using “protein preparation wizard” of Schrodinger Maestro. The modelled structures of proteins were validated through Ramachandran plot using PROCHECK. 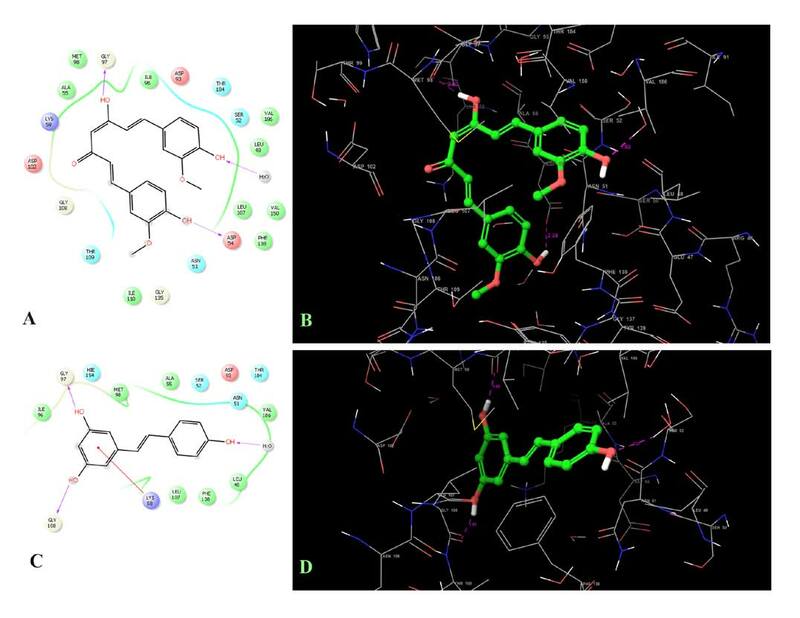 Drug compounds curcumin and resveratrol were obtained from the PubChem website https://pubchem.ncbi.nlm.nih.gov/ as SDF format and then converted and optimized to ligands using “ligprep” of Schrodinger Maestro version 10.6.014. The compounds prepared as ligands were docked against each of the prepared protein receptors using “ligand docking” of Schrodinger Maestro. Docking analysis was performed at extra precision mode with ligands made flexible. The interactions were calculated using the glide score, which was generated by the best fit of the ligand and the receptor. The ligands docked using GLIDE-Version 7.1 was graded with glide score and glide energy. The docking result for each ligand screened against each receptor protein were recorded. Curcumin was purchased from Hi Media and resveratrol was obtained as a gift sample from Sami Labs limited, Bangalore. Other chemicals used were of analytical grade. Human breast MCF-7 cells were obtained from National centre for cell sciences, Pune, India. Cells were maintained in Dulbecco’s Modified Eagle’s Medium (DMEM) containing 10%(v/v) fetal bovine serum (FBS) and incubated at 37°C of 5 % CO2. Sample containing curcumin, resveratrol, curcumin and resveratrol at the ratio of 1:1, 1:3, 3:1 by mass were used for the study. Stock solution of 1 mg/ml was prepared for each sample. 500 µl of each stock solution was then serial diluted to obtain different concentration ranging from 250µg/ml to 3.906 µg/ml. Cell viability was measured using MTT (3-(4,5 dimethyl thazole-2yl)-2,5-diphenyl tetrazolium bromide) method.21 The cell count was adjusted to 1.0x105 cells/ml using DMEM medium containing 10% FBS. 100µl of the diluted cell suspension (approximately 10,000 cells/well) was added to each well of a 96 well microtiter plate. After 24 h, the supernatant was removed and the monolayer was washed with medium. 100 µl of samples of different concentrations prepared in the media were added. The plates were incubated for 72 h at 37°C in 5% CO2 atmosphere. After 72 h, the sample solutions in the wells were discarded and 20 µl of MTT (2mg/ml) in MEM-PR (MEM without phenol red) was added to each well. All the statistical analysis was carried out by GraphPad Prism 7.0. All the data were expressed as mean±SD of three independent experiments. One-way ANOVA was used to analyse all experimental data. Statistical significance was accepted at the level of p<0.05. The docking results of curcumin and resveratrol with different breast cancer proteins are shown in Table 1. The glide score of curcumin with breast cancer proteins HER2, oestrogen receptor, ERBB2, tyrosine kinase and HSP90 are -12.1, -9.92, -8.30, -8.22 and -8.05 kcal/mol respectively, and the glide energy being -56.46,-47.85,-43.21,-47.36 and -52.63 kcal/mol respectively. The glide score of resveratrol with breast cancer proteins HER2, oestrogen receptor, ERBB2, tyrosine kinase and protein HSP90 are -7.56, -8.81, -6.37, -5.99 and -6.47 kcal/mol respectively, and the glide energy being -36.39, -36.23,-33.18,-31.74 and -39.77 kcal/mol respectively. Figures 1 to 5 represents the interaction of the ligands with the active amino acid sites of different cancer protein receptor illustrated as 2D (section A and C) and 3D (section B and D) pictures. Amino acids GLU 1419, THR 1347 of the oestrogen receptor interacts with curcumin whereas amino acids GLY 1521, LEU 1387 and LEU 1346 interacts with resveratrol (Figure 2). Similarly, with tyrosine protein kinase C-SRC docking analysis resulted in interaction of amino acids ARG 388 with curcumin whereas amino acids GLN 275, GLU 339 and MET 341 interacts with resveratrol (Figure 4). Interaction of curcumin and resveratrol with HER2, ERBB2 and HSB90 protein have common amino acid binding sites LEU83, THR 2 and GLY 97 respectively. (Figure 1,3 and 5). Table 2 represents the different amino acid binding sites of curcumin and resveratrol in each cancer protein receptor. 2D and 3D interaction of curcumin and resveratrol against breast cancer protein HER2(PDB ID 4RJ3). 2D and 3D interaction of curcumin and resveratrol against Human oestrogen receptor responsible for breast cancer (PDB ID 2IOK). The results of MTT assay for cytotoxicity against MCF-7 cell line are presented in Figure 6A and 6B. Percentage cell viability exhibited by treatment with different drug combination ratio was found to be statistically low at the concentration ratio of 7.81, 15.21 and 31.25 µg/ml when compared against curcumin and resveratrol treatment alone (1a-P<0.05, 1b-P<0.01 against curcumin and 2a-P<0.05, 2b-P<0.01,2c-P<0.001 against resveratrol). Table 3 represents the IC50 values of curcumin, resveratrol and different combination ratio against MCF-7 cell line along with CI and interpretation for synergism.23 IC50 value observed for curcumin is 21.29µg/ml and for resveratrol is 38.30µg/ml for resveratrol. Figure 6C. IC50 values for different ratio of combined treatment of drugs was found to be 28.06 µg/ml (1:1 ratio), 15.20 µg/ml (1:3 ratio) and 8.29 µg/ml (3:1). The combination index (CI) for different combination ratio is illustrated in Figure 6D. CI value of 1.08 was observed for 1:1 combination ratio indicating additive effect. CI values obtained for 1:3 and 3:1 drug combination ratio was observed to be 0.382 and 0.341 respectively, indicating synergistic effect. 2D and 3D interaction of curcumin and resveratrol against breast cancer protein ERBB2 receptor tyrosine kinase (PDB ID 2A91). 2D and 3D interaction of curcumin and resveratrol against Tyrosine protein kinase C-SRC (PDB ID 2SRC). A higher negative value of glide score and glide energy indicate more binding affinity. The hydrogen bond score indicates atomic coordinates (type and geometry of bonding) and Van der Waals interactions. The more negative hydrogen bond scale, the stronger is the hydrogen bonding and hence greater is the interaction of ligand with the protein receptor. The negative values ranging from -8.05 to -12.1 glide score and glide energy ranging from -43.21 to -56.46 for curcumin with strong hydrogen bonding and more lipophilicity indicates better interaction with the active sites of cancer proteins and inactivating them. Similarly, the negative values ranging from -5.99 to -8.81 glide score and glide energy ranging from -31.74 to -39.77 for resveratrol indicates better interaction with cancer proteins, thus inactivating them and inhibiting their contribution to cancer progression. The amino acid sites with which curcumin interacted is different from the amino acid sites interacted by resveratrol with human oestrogen receptor and tyrosine protein kinase C-SRC proteins. The protein binding of curcumin and resveratrol at different sites might help in synergistic activity to inhibit cancer progression. Hence, in vitro cytotoxicity study against MCF-7 human breast cancer cells were performed to investigate the synergistic activity of curcumin and resveratrol. 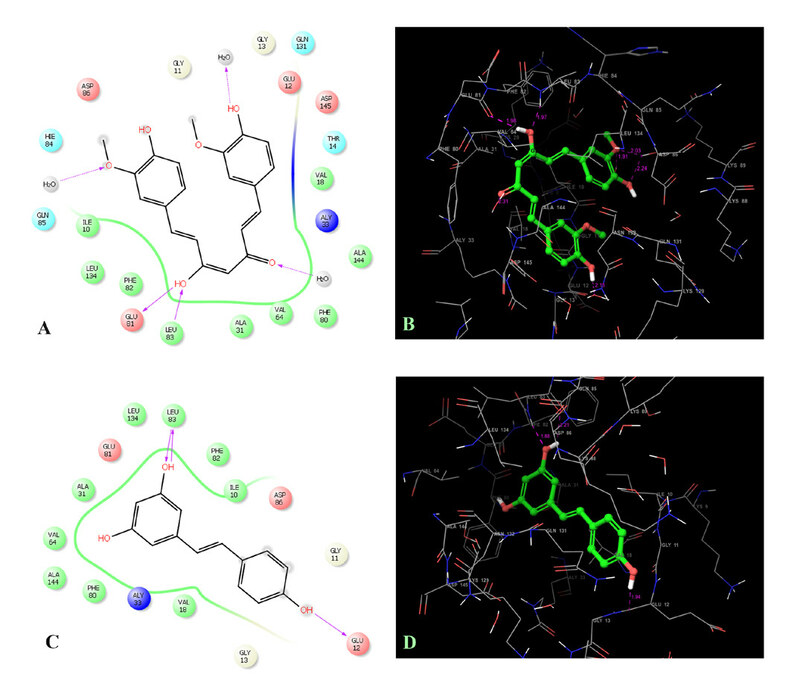 2D and 3D interaction of curcumin and resveratrol against HSB90 (PDB ID 2VJC). MTT assay resulted in cell cytotoxicity in a concentration dependent manner for curcumin and resveratrol. Combined treatment of curcumin and resveratrol significantly increased the cytotoxicity effect on human breast cancer cells (P<0.05) when compared with the either drugs alone. Combined treatment of curcumin with resveratrol at 1:1 decreased the IC50 value to 28.06 µg/ml comparatively with resveratrol (38.30 µg/ml) but increased comparatively with curcumin alone treatment (21.29µg/ml). Alternatively, treatment with 1:3 and 3:1 combination ratio enhanced the growth inhibition significantly as indicated by markedly decreased value of IC50 to 15.20 µg/ml and 8.29 µg/ml respectively. The CI analysis results suggest that the growth inhibitory effect of these two drugs was additive at 1:1 ratio (CI=1.08), while strongly synergistic at 1:3 and 3:1 ratio with CI value of 0.382 and 0.341 respectively. Results of Docking analysis of curcumin and resveratrol against different cancer proteins. Amino acids binding sites of curcumin and resveratrol in different cancer proteins. IC50 of curcumin, resveratrol and their combination with Combination Index. [6A] Cell viability by MTT assay. Values represent the mean ± S.D (n=3).1a P<0.05, 1b P<0.01 represents the data compared with curcumin; 2a P<0.05, 2b P<0.01,2c P<0.001 represents the data compared with resveratrol. [6B] In vitro cytotoxicity plots of free curcumin, free resveratrol and their combination at different ratio after 72 h of treatment. [6C] IC50 value of free curcumin, free resveratrol and their combination at different ratio. [6D] Combination Index analysis of curcumin and resveratrol combination at the ratio 1:1,1:3, 3:1. 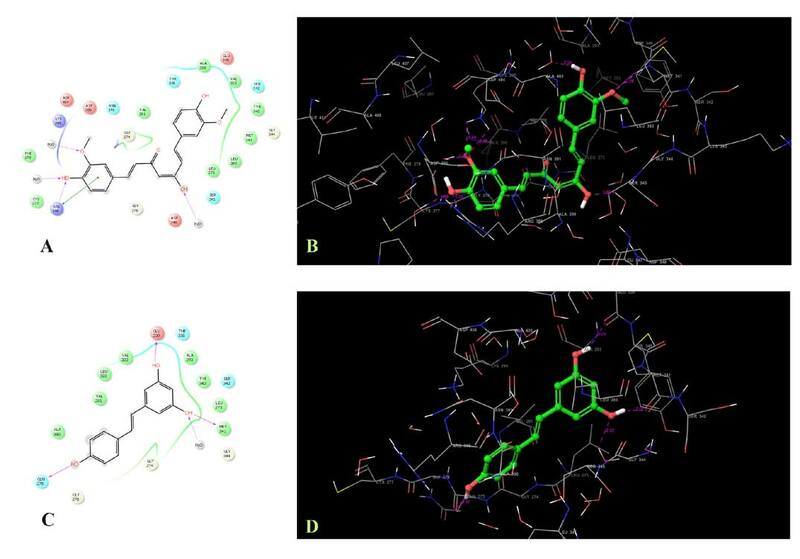 Comparative molecular docking analysis of curcumin and resveratrol against various breast cancer protein receptors helped to explore their drug combination for breast anticancer activity. More negative glide score and energy results indicate more binding for breast cancer proteins by these drugs with varying amino acid interaction sites. Results of cell line study have shown that the combination of curcumin with resveratrol additively or synergistically increase the anticancer activity of either drug. Synergistic effect of drug combination against MCF-7 cells indicates that this drug combination could be a promising approach for breast cancer treatment and chemoprevention. To gain more confirmation in vivo studies must be further investigated. However the common problem with both the drugs is their poor solubility and low absorption resulting in poor bioavailability.24,25 Among the various techniques reported to overcome these limitations, Nano delivery is a promising approach.26-29 Delivering drug combination chemotherapeutics in nanocarrier base proves promising in advanced therapeutic approach on cancer cells by the enhanced pharmacokinetics of drugs, reduced drug-drug interaction and tailored drug release.30 Studies on combination drug delivery of curcumin and resveratrol using cyclodextrin based nanocarrier are in progress. Masuelli L, Di-Stefano E, Fantini M, Mattera R, Benvenuto M, Marzocchella L, et al. , authors. Resveratrol potentiates the in vitro and in vivo anti-tumoral effects of curcumin in head and neck carcinomas. gene expression. 2014;4:5(2014;5(21):10745).